Book by end 31st May and SAVE! Book your School Trip to Europe before the end of May and save a further £10pp! Every year the centre of Cologne is touched by the magic of Christmas markets, attracting over four million visitors a year. With seven different markets open daily, and well into the evening, the city is a magical place to visit at this time of year. Beneath the largest Christmas tree in the Rhineland, you can sample sweet delicacies, watch artisans at work or head to the old market to visit the nostalgic childrens roundabout. Cologne's cathedral is one of the best-known architectural monuments in Germany. 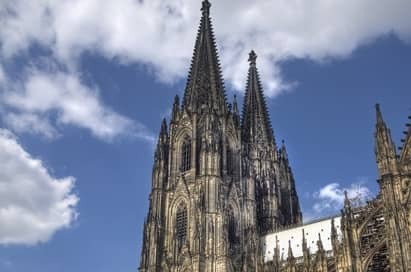 The cathedral is under the administration of the Roman Catholic Church and is the seat of the Archbishop of Cologne as well as housing the remains of the Three Wise Men. The two Bell Towers dominate the city skyline and can be climbed for panoramic views of the city. What would Cologne be without the Rhine? 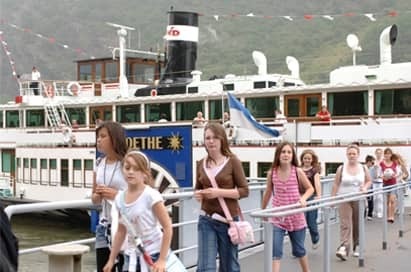 The Rhine has been a significant traffic artery for transporting goods to the city as well as a popular route for river cruise tourism. As well as round trip cruises which offer your students a pleasant way to get to know the city, it makes for a more leisurely way to travel to and from your visits. Take a guided tour of this unique museum located in front of the old town near Cologne Cathedral. Presenting the entire history to the present day of cocoa and chocolate production, pupils can watch the manufacturing process and learn about the history of chocolate with free samples for pupils and teachers. Enjoy a fascinating journey through 2500 years of sport and Olympic history, with unique exhibits from ancient Greek athletics to the professional sport of the 21st century. Pupils can also take a guided tour, in German or English, to gain an insight into sports history and look at memorabilia. The cable car offers you the most attractive bird's-eye view of the city. Take a leisurely trip across "Old Father Rhine" and admire the city's fascinating panorama. Enjoy a relaxing view of Cologne as you cross unhurriedly from one bank to the other. 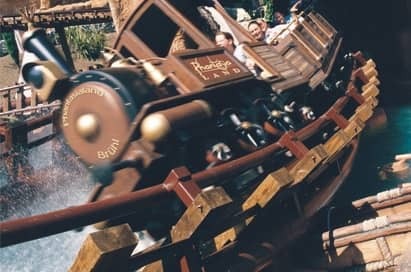 Phantasialand is one of Europe’s top entertainment parks. Situated in Brühl near Cologne in the heart of the Rhineland, seven themed areas promise a fun and educational experience for all your students. Each themed area has its own individual character but they all have one thing in common: the potential for learning through experience. Bimmelbahn Mini Trains run daily through the Old Town to the Chocolate Museum and German Sports and Olympics Museum, or along the Rhine promenade to the Cologne Zoo, Flora Botanical Gardens, Rhine cable cars and back. During Advent, there are trains going to Cologne’s popular Christmas Markets. Along the Rhine Gorge UNESCO World Heritage Site, there is a castle on average every 2.5 kilometres. 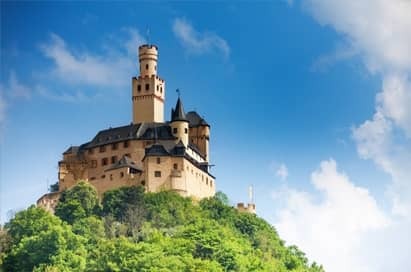 The Marksburg Castle is one of the few castles that have survived the centuries without destruction and parts of it date back to medieval times. A guided tour will show students around the castle providing them with a true glance back into previous centuries. The information pack was very helpful and much better organised than other study group organisers. The team was most helpful in all aspects especially when we had decided to fly instead of going by coach. We had a great trip overall and the students got to practice their language skills which was the main objective. I feel that EST did everything possible, especially in the planning stages, to make sure the trip ran smoothly. European Study Tours Limited registered office: 4 Post Office Walk, Fore Street, Hertford, SG14 1DL.